Āl al-ʿabā (آل العبا) or Ahl al-Kisāʾ (اهل الكساء), in Persian/Urdu: Panjtan Pāk (پنجتن پاک) is a Islamic term, literally meaning the people of the cloak, that refers to the five purified and exalted souls that include the excellencies the Messenger of Allah ṣall-Allāhu ʿalaihi wa-sallam, Sayyidunā Imām ʿAlī al-Murtaḍā, Sayyidah Fātimah az-Zahrāʾ, and their two sons Imām Ḥasan and Imām Ḥusain raḍiyAllāhu ʿanhum. 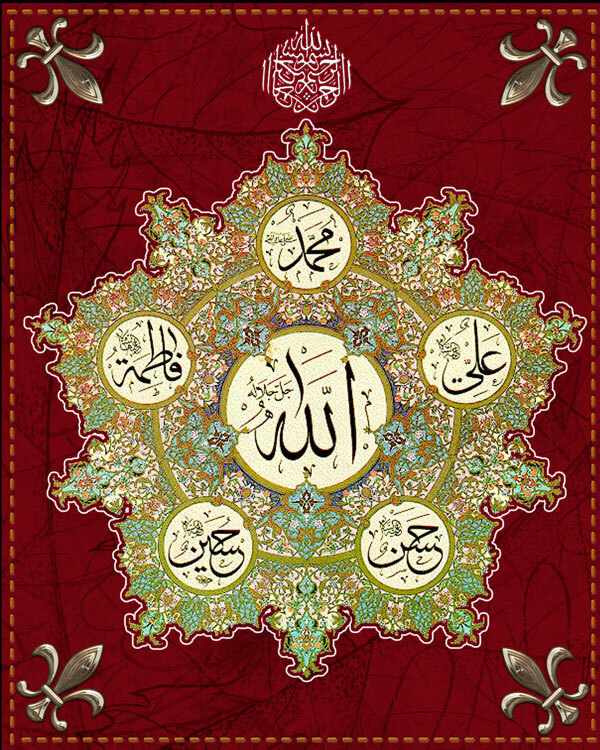 There are other Ḥadīth as well in the Sunni literature that refer specifically to these five noble souls. Following Ḥadīth mentions their virtues. There are numerous other Ḥadīths about the merits of Ahl al-Bayt and specifically the four mentioned ones. However, this short article is about the devotion of the Naqshbandi masters to The Five, so below I present short epistles from history and teachings of the masters of this noble order. The great Sufi master and founder of the Naqshbandī order, Sayyidunā Khwāja Bahāʾ ad-Dīn Naqshband al-Bukhārī quddisa sirruhū was a true lover of these pure five souls. He has expressed his devotion to them in a number of verses in which he lauds and supplicates them and seeks their intermediation in the spiritual and material issues. Following verses show his utmost faithfulness to the Āl al-ʿAbā specifically. Be Minnat-i Makhlūq Mā ʿAl-al-Aʿlā. “O Lord! By the sake of the prophethood of Prophet of all the worlds! O Lord! By the sake of the victorious leader of Badr and Hunain! In this work, he proved the validity of calling these five noble souls Āl al-ʿAbā (Khamsat at-Ṭāhirah in Arabic, meaning The Purified Five). Makhdūm Hāshim was not just a scholar but a master of the Qādrī and Naqshbandī Sufi Paths and a venerated Muslim saint. The accusation of being a Shia against Sunni scholars is not so new. The greatest Sunni Imāms such as Abū Ḥanīfa and Shāfiʿī were also blamed with the sin of their love. Unfortunately, today there are factions inside Sunni Islam who consider themselves Sunni Muslims and even claim to follow Sufism, yet they do not venerate the Five, rather accuse those who do so of being Shia. Rubāʿiyāt-i Khwāja Naqshband (Urdu): collected verses of Shāh Naqshband, compiled and translated by Muḥammad ­Ṣādiq Qusūrī, Al-Madīnah Publications, Lahore. June 1997. Maktūbāt Imām Rabbānī (Persian), Urdu translation by Sayyid Zawwār Husain Shāh. Khulāṣat al-Nafaḥāt al-Bāhirat Fī Jawāz al-Qawl Bi’l-Khamsat at-Ṭāhirah (Persian), by Makhdūm Muḥammad Hāshim Thattvī Sindhī (d.1174H). Translated in Sindhi by Mawlānā Muḥammad Idrees Dāhirī Naqshbandī. Hyderabad, Pakistan, 2000. This entry was posted in Ahl al-Bayt. Bookmark the permalink.